Barnard Castle in County Durham. A picturesque small town amongst beautiful countryside. The remains of a large Norman castle and the central market place are worth a visit and whilst in town there are some excellent pubs and lots of walks in the surrounding countryside. 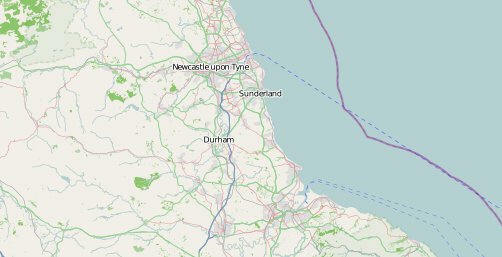 The Tees Railway Trail - a 7 or 8 mile walking / cycling trail in County Durham near Barnard Castle. Not the best trail we have cycled as there are many gates with steep slopes on their approach and exit - a bit of an obstacle course for cyclists. But with good views and the opportunity to visit several close by villages to divert into en route to explore or to visit the local pub. 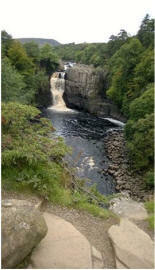 High Force is an impressive waterfall on the River Tees in County Durham. Car and motorhome parking at Bowlees. A great riverside walk up the the High Force then back a bit too cross the river to a hotel and pub before walking back to Bowlees across open fields with great views. About 6 miles with a pleasant pub en route serving a range of real ales and food.